Triumph Motorcycles is a British motorcycle manufacturer, originally based in Coventry. A new company in Hinckley took over the name rights after the collapse of the company in the 1980s. Triumph began in 1885 when Siegfried Bettmann left his homeland, Germany, for Coventry in England. Just prior to leaving, he had founded a company called Bettman. In 1886, Bettmann sought a more universal name, and the company became known as the Triumph Cycle Company. In 1886. the company registered as the New Triumph Co. Ltd. with financial backing from the Dunlop Pneumatic Tyre Company. At first Triumph manufactured bicycles but in 1898, Triumph extended its own production to include motorcycles. By 1902, the company had produced its first motorcycle - a bicycle fitted with a Belgian-built engine. By 1903, motorcycle sales topped 500, Triumph opened motorcycle production at its unit in Germany and during its first few years producing motorcycles, the company based its designs on those of other manufacturers. In 1904, Triumph had its own designs and in 1905 produced its first complete motorcycle in-house. In 1907, production reached 1,000 bikes. Triumph had also launched a second, lower-end brand, Gloria, produced in the company's original plant. During World War I, Triumph boosted production to more than 30,000 motorcycles including the Triumph Model H Roadster or "Trusty Triumph," often cited as the first modern motorcycle. A unique feature of this 1920's Triumph is the four-valve cylinder head, designed by British engineer, Harry Ricardo. Although a simple machine, the "Riccy", as proud owners would refer to their machines, was a very well constructed and durable design proven in the battlefields of the first World War. In 1929, financially troubled Triumph spun off its German subsidiary as an independently owned company, which became part of the Triumph-Adler. They manufactured motorcycles under the Triumph brand until 1957. In 1932, Triumph sold off its bicycle manufacturing facility to Raleigh. By then, and Bettmann had been forced out of the chairman's spot. He retired completely in 1933. in 1939 Triumph was acquired by Jack Sangster and his Standard Motor Company and did well since SMC owned Ariel Motorcycles. 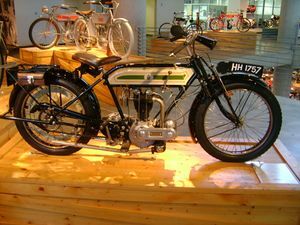 The Coventry plant made motorcycles until World War II when Coventry was destroyed in German Blitz. Tooling and machinery was recovered from the site and production restarted at the new plant at Meriden, West Midlands in 1942. Triumph did manufacture a portable generator for the RAF using 500cc Triumph engines with alloy barrels. The Speed Twin designed by Edward Turner before the war was produced in large numbers after the war. Efforts to settle the lend-lease debts caused nearly 70% of Triumphs post war production to be shipped to the United States. The Triumph Speed Twin and Triumph Tiger 100 were available after the war. They had a sprung rear hub for a rear suspension. During the late 1940s, Modified Triumph Tiger 100s won many races and inspired the Triumph GP model. By 1950 the GP model was dropped. The American market applied considerable pressure to reverse this backward step, and a die cast close finned alloy barrel was made available. The alloy head made the valve noise more obvious, so ramp type cams were introduced for alloy head models to reduce the noise. 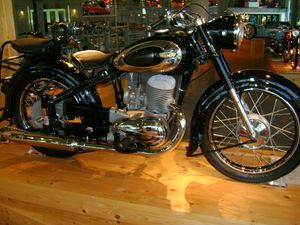 In 1951 Triumph was bought by BSA and manufacture of Triumph motorcycles continued when BSA merged with Norton-Villiers. This technically interesting machine was built by Triumph Werke-Nurnberg, a subsidiary of the British Triumph Company until 1929, when they went their separate ways. Features included a chrome plated alloy cylinder, single connecting rod with two pistons, hydraulically operated rear brake and totally enclosed rear chain. TWN produced high quality motorcycles from 1903 to 1957. This page was last edited on 23 November 2010, at 21:47.